Lamborghini is heading into the future with a systematic lightweight design concept – the intensive application of carbon-fiber materials forms the key foundation for the extreme dynamics and less emissions that will define its future super sports cars. The new V12 model that will debut at the 2011 Geneva motorshow is based on a full monocoque construction made from innovative carbon-fiber technology and superior to anything else on the market – developed and produced entirely by Automobili Lamborghini. This development sees Lamborghini once again demonstrate its worldwide leading expertise in carbon-fiber reinforced plastics (CFRP) technology. The super sports car brand from Sant’Agata Bolognese is the only automaker to have fully mastered the extensive CFRP process across a range of technologies in-house – through design, simulation, engineering, prototyping, testing, validation and production, using state-of-the-art industrial processes to the very highest quality standards. Lamborghini is putting its innovative, in-house developed and patented technologies into series production for the first time with the successor to the Murciélago. Automobili Lamborghini is a 100 percent subsidiary of AUDI AG and makes extensive use of the Audi brand’s renowned, world-leading expertise in lightweight engineering. Audi is particularly advanced when it comes to the high-volume application of aluminum, which Lamborghini uses in areas such as the space frame construction of the Gallardo model range. In the field of fiber-reinforced composite materials, the competences of Audi and Lamborghini are perfectly balanced – Lamborghini’s contribution to the partnership includes decades of experience with carbon fiber and know-how in the development and production of low-volume models, while Audi is working with a number of lightweight materials on an intelligent hybrid construction concept. The fundamental thinking is the same for both brands – every future model generation must be considerably lighter than its predecessor. Lamborghini’s flagship is made of a full monocoque. In contrast to some competitors, the entire occupant cell – the tub and roof – is one single physical component. This ensures extreme rigidity and thus outstanding precision on the road, as well as an extremely high level of passive safety for the driver of the new super sports car and his passenger. The entire monocoque weighs in at only 147.5 kilograms (324.5 lbs). The pushrod suspensions, the twelve-cylinder engine and the innovative, super-fast shifting ISR transmission are all connected to the monocoque via aluminum sub-frames front and rear. This lightweight design features an impressive combination of extreme rigidity and very low weight. The entire chassis of the future V12 model boasts an enormous static torsional stiffness of 35,000 Newton meters per degree. Yet the whole body-in-white weighs only 229.5 kilograms (504.9 lbs) – a best-in-class for a super sports car with a stunning power output of 515 kW / 700 hp. A completely new 5400 sq. meter production facility has been built in Sant’Agata for the innovative monocoque and the complete body-in-white of the Murciélago successor. A state-of-the-art process combines automated production with meticulous craftsmanship to create carbon-fiber structures of the very highest quality and precision. Major elements of the monocoque are produced using Lamborghini’s patented “RTM-Lambo” technology. This process does not necessitate the laborious use of hand lamination and autoclave, and at the same time uses production molds made from carbon fiber, making RTM-Lambo a significant step forward in production technology. One figure in particular illustrates the importance of carbon-fiber technology to Lamborghini – 2009 saw around 100 tonnes of carbon-fiber materials used in production, a figure that will triple to more than 300 tonnes by 2013. With the successor to the Murciélago, Automobili Lamborghini is implementing across its entire model lineup an optimum lightweight design strategy based on the respective vehicle and volume. The most important base material alongside carbon fiber is aluminum, where Lamborghini benefits from the leading lightweight engineering expertise possessed by the Audi brand. The Gallardo range, for example, is built using Aluminum Space Frame technology, complemented by the targeted application of carbon-fiber components. With a dry weight of only 1,340 kilograms (2,948 lbs), the Gallardo LP 570-4 Superleggera is the most lightweight super sports car in its class. Automobili Lamborghini embarked upon a program of extensive investment in its preparations for the next technological leap to a complete carbon-fiber monocoque. The super sports car brand is now driving forward technology development in two in-house research centers, the Advanced Composite Research Center (ACRC) in Sant’Agata Bolognese and the Advanced Composite Structures Laboratory (ACSL) in Seattle, USA. Partners in the intensive research and development cooperation include aerospace giant Boeing, the University of Washington and golf equipment manufacturer Callaway. A host of patents for materials, as well as design, bonding and production technologies, document the innovative spirit of the Italian brand. The clear commitment to carbon-fiber technology is also a major factor in Lamborghini’s preparedness for the future. “Lamborghini stands for extreme and uncompromising super sports cars in the best Italian tradition. For Lamborghini, however, innovation has always been part of that tradition. The time has come for us to redefine the future of our super sports cars. Obviously, the focus is on our customers’ two most important purchasing criteria – design and performance. Design has always been the number one reason for wanting to own a Lamborghini – and that’s not going to change. We will ensure that a Lamborghini will always remain unique and clearly recognizable. Performance, on the other hand, is something that will be extensively redefined. Just a few years ago, the most important aspects were top speed, acceleration and handling – in that order of priority. However, things have changed since then. Together with design, handling and acceleration have become increasingly important. Top speed is no longer as decisive, because all super sports cars can manage more than 300 km/h (188 mph) – a speed that can barely be attained on the race track, and that is out of the question on the public roads of most countries on earth. Nowadays, the issues of handling and acceleration are far more crucial to consistent driving fun. The power-to-weight ratio is the key factor in the improvement of both and in the experience of more direct driving fun. This means that increased power is no longer the focal point – because we no longer need to achieve higher top speeds, and because CO2 emissions are relevant for super sports cars, too. This means that weight must be reduced. It is important to understand how best to approach this reduction. Since the 1980s, the average weight of our vehicles has increased by around 500 kilograms (1,100 lb), due to the requirements set by safety, comfort and emissions reduction. This is a trend that we must reverse with urgency. However, because cannot sacrifice either safety or comfort, we will start using new materials. The magic words are carbon fiber. We already began working with this in Sant’Agata Bolognese more than 30 years ago. We now have two research laboratories in Sant’Agata Bolognese and Seattle, and we have mastered a host of technologies that put us in a clearly dominant position when it comes to low-volume series production. With our new plant for building carbon-fiber monocoques and complete carbon-fiber bodyshells, we are delivering the highest quality levels and absolute precision. Carbon composite materials are a key technology for the automotive engineering of tomorrow, especially for high-performance sports cars. These materials made from CFRP combine the lowest possible weight with excellent material characteristics – they are very light, extremely rigid and exceptionally precise. Of course, the term “single shell” applies only in the descriptive sense – the new Lamborghini monocoque is made from a series of individual parts with specific functions, such as stiffening elements made from Braiding technology, that is one of the best technology to manage energy adsorption in case of crash. After the curing process, however, this structure functions as a single component – including the base section known as the tub and the complete roof. 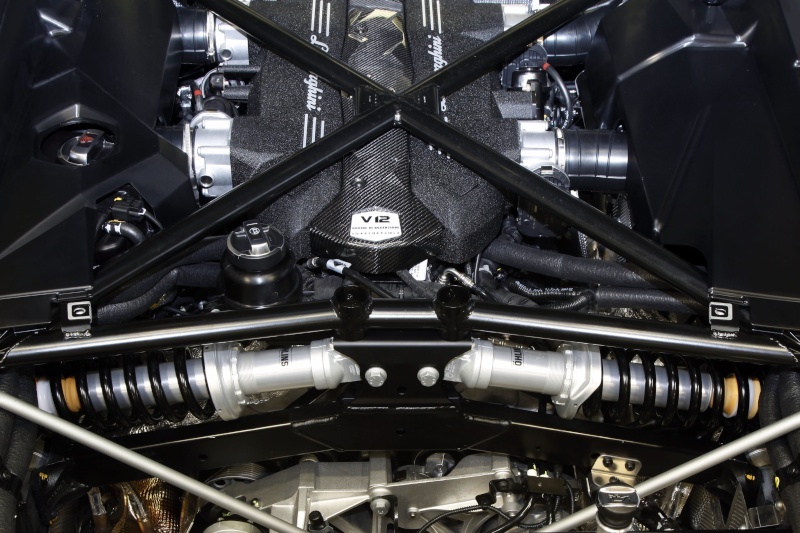 The entire body-in-white of the future V12 model weighs only 229.5 kilograms (505 lbs) and boasts phenomenal torsional stiffness of 35,000 Newton meters per degree. This guarantees a superb feeling of solidity, but, more importantly, extremely exact wheel control with excellent steering precision and sensitive feedback. For the dedicated driver, both are essential for truly enticing driving pleasure. The new Lamborghini flagship responds to the most minute steering input with the stunning precision of a perfectly balanced race car. Resin Transfer Moulding (RTM): In this process the carbon fiber mats are preformed and impregnated with an exact amount of resin. Afterwards, they are cured under heat while the part is in the mold. 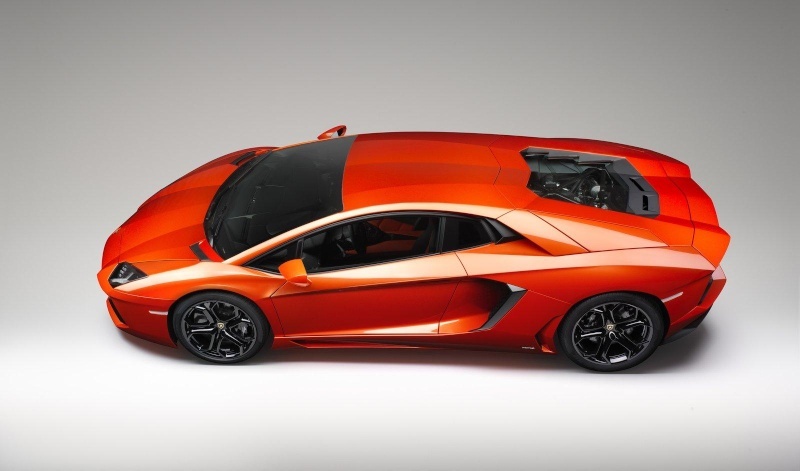 Lamborghini has achieved a major breakthrough by further developing this method. Using the patented “RTM-Lambo” process, the final mold is no longer a heavy, complex metal piece, but is made instead from lightweight carbon-fiber parts, thus making the manufacturing process faster, more flexible and more efficient. An additional benefit of the RTM-Lambo process is the low injection pressure that doesn’t require expensive equipment. Quality control is an absolutely crucial factor – every single monocoque is measured to exacting tolerances of only 0.1 millimetres, facilitating the extreme precision of the overall vehicle. Quality control starts with the purchase of the carbon fiber parts. Every delivery of carbon fiber is certified and the material is checked regularly for compliance with quality standards. Lamborghini worked together with its suppliers to develop a world-exclusive fiber and resin system for its RTM technology. Ultimately, these materials and processes constitute an important part of Lamborghini’s worldwide leading expertise in the field. Lamborghini has achieved an impressive level of innovation not only in the design and development of carbon-fiber structures, but also in the associated production technology. For the future twelve-cylinder flagship and its monocoque bodyshell made from carbon-fiber reinforced plastic, a brand new production facility was built at company headquarters in Sant’Agata Bolognese. Every single production step from receipt of the fiber mat rolls to completion of the paint-ready bodyshell is carried out in-house. 1. The prepreg parts are made on the first line. They meet extremely high demands for stiffness and surface quality, but require a high level of manual labor and must be cured in an autoclave under heat and pressure. 2. On the second line, parts and sub-assemblies are made using resin transfer molding (RTM) technology. This process is highly automated. The autoclave is not required, with curing taking place in a heated chamber. This is also where the prepreg parts from the autoclave and the epoxy foam parts are integrated into the RTM monocoque structure. 4. On the fourth line the monocoque structure and the roof are fully machined, assembled together and measured. 5. 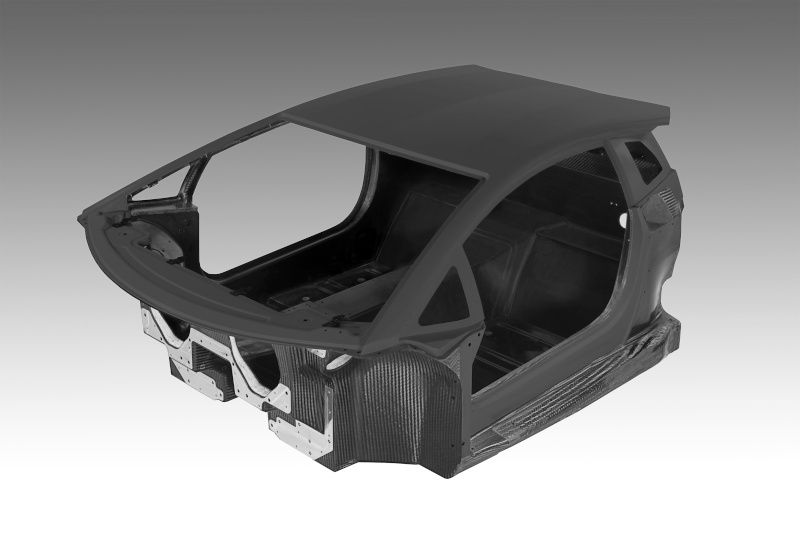 On the fifth line, the finished monocoque is precisely connected to the aluminum front and rear sub-frames and all exterior bodyshell parts to create the finished bodyshell. The prepreg line starts with the automated cutting of the parts. The computer-controlled cutting machine ensures maximum precision, as well as minimum cutting strokes and waste. The machine is located in a climate-controlled room, because the prepreg materials must be maintained at a low temperature until the final stage of the process. The subsequent laminating work carried out on the prepreg parts is handled by highly experienced specialists. They create the complex forms and ensure the highest possible aesthetic quality of the finished product. After a vacuum bagging process, The final curing takes place in two autoclaves. They operate at a pressure of 6 bar and a temperature of 135 degrees Celsius. The RTM line commences once the dry fiber patches have been cut, with the automated pre-forming of the parts. The fiber mats are formed in a press – similar to the sheet metal presses used in conventional bodyshell manufacture. This technology enables complex structures to be produced to an extremely high level of precision. The final positioning process carried out on the parts is handled by lasers, where the pre-formed parts are are joined together in their final form on the tooling .Once the tooling is closed, the resin injection starts followed by curing at around 100 degrees Celsius. Using the patented RTM-Lambo technology, the moulds are made from carbon fiber instead of steel – in some cases, the component just completed serves as the “mould” for the next step in the process, to which the additional parts are simply added and co-cured. A tolerance of only 0.1 millimeters applies throughout. On the assembly line, the monocoque is connected to the aluminum sub-frames and all additional parts ranging from the front spoiler to the rear diffuser. At this point, every vehicle is measured in its entirety; the automatic precision measuring system works partly with lasers and partly by touch. Surface quality is ultimately checked in a light tunnel by highly-trained specialists. Finally, the body-in-white is signed off for painting and for full vehicle assembly. Lamborghini possesses many years of expertise in carbon-fiber reinforced plastics technology (CFRP). The super sports car brand from Sant’Agata Bolognese is the only vehicle maker to have mastered the entire CFRP process across several technologies in-house – from 3D design, through simulation, test, production and validation, all in a state-of-the-art industrial process to the very highest quality levels. Lamborghini has around three decades of experience with this hi-tech material. The early eighties saw the production of its first prototype carbon-fiber bodyshell. Carbon-fiber reinforced plastics have been used in the brand’s series production models since 1985, with their proportion growing continually every since. The company is now working hard to expand its worldwide leading position – at the new Advanced Composite Research Center at company headquarters in Sant’Agata, company engineers and technicians are working on innovative design and production methods for carbon-fiber applications in automotive engineering. At the Lamborghini Advanced Composite Structures Laboratory at the University of Washington, the behavior of these materials is being researched and tested under everyday conditions and crash situations, with input from a wide range of cooperation partners. 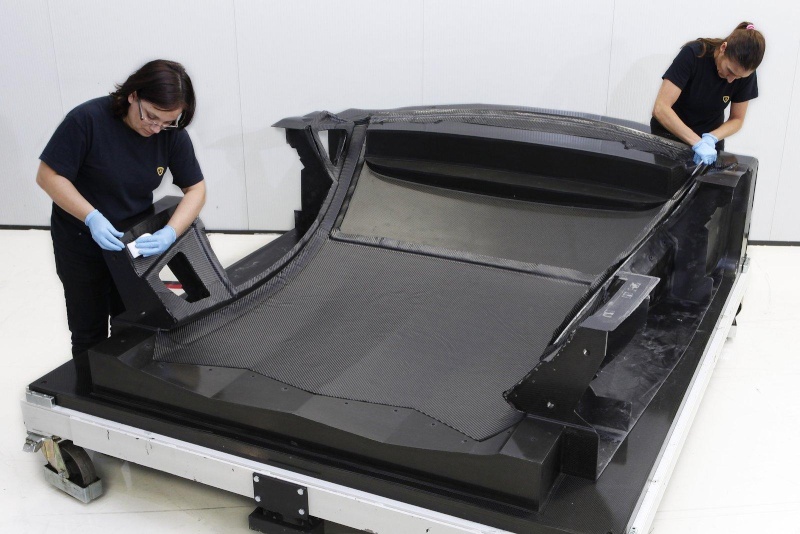 Finally, the innovative monocoque and the entire bodyshell of the Murciélago successor are being produced at the expansive new carbon fiber production facility in Sant’Agata Bolognese. The ACRC research and development center places Lamborghini at the very top when it comes to the research of innovative materials and new methods for low-volume production. More than 40 experts work here to develop vehicle components of all shapes and sizes. These specialists build prototypes and the associated tooling, and derive concepts for optimum production methods. They also develop the appropriate repair techniques for CFRP structures. One major focal point is simulation technology – an especially complex topic when it comes to carbon fiber. With sophisticated systems developed largely in-house, engineers can reliably and precisely calculate the technical characteristics and crash behavior of CFRP components. A host of patents document the creativity and innovation of the development work being carried out by Lamborghini. The ACRC comprises two facilities on the factory site in Sant’Agata. In the “Prepreg Center”, conventional production methods using autoclaves are perfected, while, at the so-called “Out of Clave Center”, work is focused on innovative technologies that do not require the use of large-scale autoclaves. One technology developed here includes the patented “RTM-Lambo” production process. Core to the development work carried out at the Lamborghini Advanced Composite Research Center is the cooperation with highly competent partners from science and industry. In 2010, a partnership was agreed between Lamborghini, aircraft manufacturer Boeing and the University of Washington in Seattle. One research topic is new kinds of repair technologies for complex carbon-fiber structures. The partners are working on further topics such as wireless temperature sensors that are bonded into the fiber structures. Lamborghini is also securing its leading position in the application of carbon fiber well into the future. Engineers at the ACRC are working with the very latest equipment – including a heated 1000-tonne press – on technologies for use on the vehicle generations of tomorrow and beyond. Forged Composite® is the keyword for the lightest, most stable and most precise material used to-date. In contrast to conventional CFRP materials based on long, interwoven fibers, this revolutionary material is made from 1-2 inch short fibers. More than 500,000 braided fibers per square inch create a material that has only one third of the density of titanium, yet is considerably stronger. Thanks to an innovative forging process, Forged Composite can be formed very efficiently and to the highest levels of precision. Lamborghini offered a first glimpse of the outstanding characteristics of Forged Composite with the Sesto Elemento prototype. Its monocoque and parts of its suspension are made from Forged Composite. However, there is still development work that remains to be done before this material can be used in series production. Automobili Lamborghini’s partner in the development of Forged Composite is Callaway Golf Company, the world’s leading manufacturer of golf equipment. Callaway uses Forged Composite to produce club heads with vastly superior characteristics than those made using conventional metal alloys. The Lamborghini Advanced Composite Structures Laboratory (ACSL) at the University of Washington in Seattle, USA is another element in the extensive investment made by Automobili Lamborghini in carbon-fiber technology. Since 2007, Lamborghini has been providing the laboratory with substantial funding, thus supporting long-term research work at the university. The ACSL has borne its name since 2009. One of the main tasks of the laboratory is its work as the hub for all Lamborghini’s cooperation partners in the USA, such as Callaway Golf and Intel. Further partners in the joint programs are aircraft manufacturer Boeing and the American Federal Aviation Administration (FAA). Boeing in particular possesses an enormous amount of expertise in the field, with the new Boeing 787 Dreamliner being the first commercial airliner to feature a fuselage made from carbon-reinforced plastic. One focal point of the work done at the ACSL is material analysis and simulation. The crash behavior of composite structures in an automobile was, for example, the subject of a core research project. A key term in materials research and simulation technology is the Building Block Approach. This technique sees small samples of new materials tested and defined in minute detail. As soon as the material and its characteristics are perfectly understood, a slightly larger test piece is made and tested again. At a later point, an entire component 1:1 scale is made using this material and tested. As in a building block system, the simulation is always calibrated with the real crash test case, in order to have an excellent level of predictability in the 1:1 real crash test. Further down the line, of course, real prototypes are also destroyed in the real crash test facility – although only to validate findings. Lamborghini and its cooperation partners like Boeing now find themselves in the final years approaching a major breakthrough. With the Building Block Approach, complete crash simulation is also possible with a CFRP structure. Boeing uses the same methodology for the development of commercial aircraft - the 787 was validated using this simulation method. Naturally, even a super sports car can meet with the occasional accident or misfortune, which is why Lamborghini has taken the necessary precautions – with a dedicated repair concept and a small team of specially selected and trained experts, a damaged Lamborghini is in excellent hands. These “flying doctors” support Lamborghini service centers on site in assessing the damage, and then handle repairs to the carbon-fiber structure themselves. The Lamborghini promise is that the repaired area is 100 percent the same quality as the original part. Smaller damages to the carbon-fiber exterior of a Lamborghini model such as this are generally unproblematic – add-on components are easy to replace. What is considerably more troublesome is damage to the load-bearing structure of the super sports car – this calls for highly specialist know-how, because the extent and implication of the damage can only truly be assessed by absolute experts. For this reason, Lamborghini service centers do not carry out this kind of work themselves; the repair expertise rests with the Lamborghini Advanced Composite Research Center (ACRC). The dealer only photographs and documents the damage and sends his findings to the ACRC in Sant’Agata Bolognese, where the experts evaluate the information. In the event of a structural damage, one of the flying doctors gets on the next plane with his tool kit. In the service center workshop, the flying doctor uses his NDI (Non-Destructive Inspection) equipment to assess whether, alongside the visible damage, there are any hidden cracks in the carbon-fiber structure. He will then carry out a professional repair that fully reinstates the physical performance of the structure – something that is also confirmed for the customer by means of a certificate. The idea for the flying doctor program was created through the cooperation with Boeing. The aircraft company has been working for some time with this kind of traveling specialist and has developed a system that enables carbon-fiber repairs to be carried out perfectly using a very compact set of equipment. 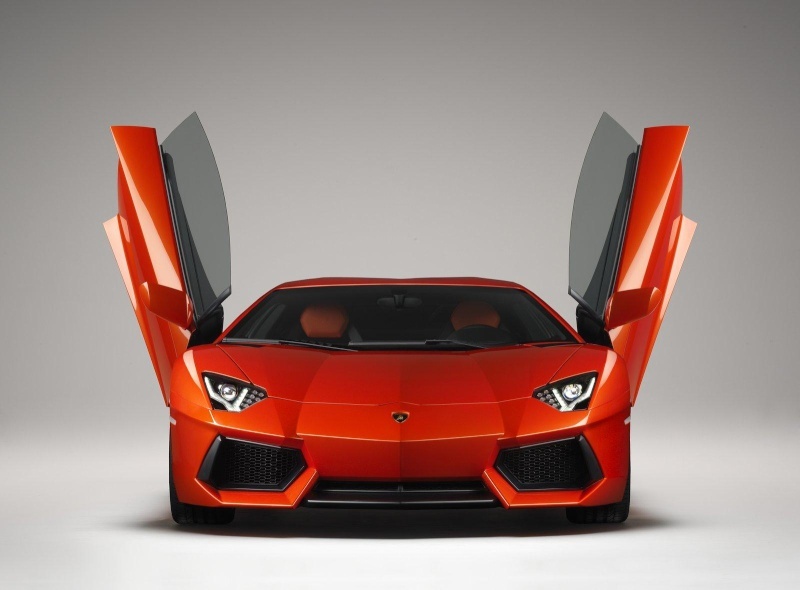 At Lamborghini, the system was further developed to suit the requirements of automotive technology and then applied to the benefit of the customer. The repair process is one further element in the extensive carbon-fiber competence possessed by Automobili Lamborghini. Naturally, the leading expertise developed by the brand from Sant’Agata can also be found in a host of patents. They apply to such innovations as the RTM-Lambo production process, the monocoque assembly concept, the system used to connect the CFRP structure to the metal components, the self-heating tools used in the RTM process, the bodyshell of the Sesto Elemento concept car and its unique paint finish and to Radicarbon, an adaptation of Forged Composite. Further patent submissions are currently undergoing the registration process and apply to future developments. Automobili Lamborghini is working on the further development of carbon-fiber technology together with the most renowned of partners. The hubs of activity in this know-how network are Lamborghini’s two research and development centers, the ACRC and the ACSL. The most important partners are the University of Washington, Boeing and Callaway Golf. The University of Washington in Seattle was founded in 1861and is one of the foremost universities in the USA. Due to its proximity to world-leading aviation firm, the Boeing Company, the University of Washington possesses particular expertise on all areas associated with aeronautics and carbon-fiber engineering. The head of the Automobili Lamborghini Advanced Composite Structure Laboratory based here is Professor Paolo Feraboli, who has been in close contact with the engineers in Sant’Agata for many years. Callaway Golf, on the other hand, is the world’s leading company in a completely different sector – golfing equipment. The Callaway Golf Company produces and sells golf clubs and golf balls and sells golfing attire, shoes and accessories under a number of different brands in more than 110 countries worldwide. In striving continuously for innovation, the Callaway Golf Company develops products that can improve the performance and skill of every golfer. For the engineers at Callaway, the application of carbon-fiber composite materials instead of steel and titanium offered the chance to develop advanced club heads that enable better transmission of force to the ball and more precise trajectories. The “Forged Composite” developed through the joint efforts of these two research and development teams is the first result achieved by the cooperation of Callaway and Lamborghini. 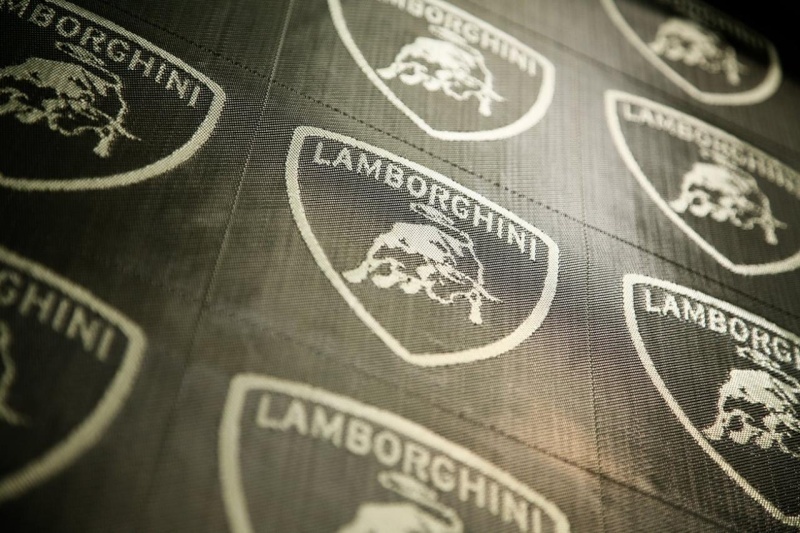 Automobili Lamborghini has around 30 years of experience with fiber-reinforced plastics. As far back as 1983, engineers in Sant’Agata built a prototype of the legendary Countach using an occupant cell made entirely from CFRP – a sensational pioneering achievement at the time. The 490 hp V12 was put through its paces in extensive test driving and demonstrated impressive dynamics due to its weight advantage. This one-off finally met its end in a crash test – the automotive industry’s first crash test with a carbon-fiber road-going sports car. For Lamborghini, this marked an impressive demonstration of its role as a pioneer in fiber-reinforced plastics – series production of the complete vehicle was, however, not feasible at the time. It was in 1985 that the first components made from glass-fiber reinforced plastics made it into series production – the front hood and engine cover of the Countach Quattrovalvole were made from this material. Lamborghini made a major technological leap in 1990 with the presentation of the Diablo – this marked the first significant application of carbon fiber, and not just for virtually all the exterior panels, but also in the bodyshell structure. An underbody/tunnel component made from CFRP provided stiffening for the tubular steel structure. The proportion of glass and carbon fiber grew substantially in the 1993 Diablo Roadster – with the entire exterior skin, the hard top and the spoiler made from fiber-reinforced plastic. The 2001 Murciélago brought with it the next step in the Lamborghini lightweight philosophy. The center tunnel, substantial parts of the underbody and the wheel arches were made from CFRP and provided additional stiffening to the tubular steel structure. With the Murciélago Roadster came further subassemblies, such as the structural framework around the driveline. The highly exclusive limited-edition Reventón super sports car and Reventón Roadster from 2008 and 2009 would not have been possible without the extensive application of carbon-fiber technology. Here, too, all exterior panels and significant parts of the bodyshell structure were produced in CFRP. The current Gallardo LP 570-4 Superleggera and Gallardo LP 570-4 Spyder Performante demonstrate how the targeted application of carbon fiber can make an already excellent lightweight design even better. Thanks to its intelligent aluminum structure, the complete Gallardo model range is already among the most competitive in the super sports car sector when it comes to power-to-weight ratio. Yet it was possible to improve even on this figure – with a dry weight of only 1,340 kilograms (2,948 lbs), the Superleggera is the undisputed best-in-class. The weight reduction of 70 kilograms for the Superleggera compared with the already incredibly lean Gallardo is due largely to the targeted application of carbon-fiber components on the bodyshell and in the interior. The engine bonnet of the Gallardo Spyder and Gallardo Spyder Performante is the automotive industry’s largest carbon-fiber component with class A surface quality. In 2011, the successor to the Murciélago will see Lamborghini begin a new chapter – for the very first time, a full monocoque structure made from carbon fiber will form the basis for a super sports car bearing the sign of the bull. Lamborghini’s Geneva motor show launch of its Murciélago replacement promises an extraordinary new technology-driven super sports car. One significant feature will be the extensive use of carbon fiber-reinforced polymer (CFRP) technology throughout the car, and in particular, in the entirely carbon fiber composite monocoque. Resin Transfer Moulding (RTM): In this process the carbon fiber mats are preformed and impregnated with an exact amount of resin. Afterwards, they are cured under heat while the part is in the mold. 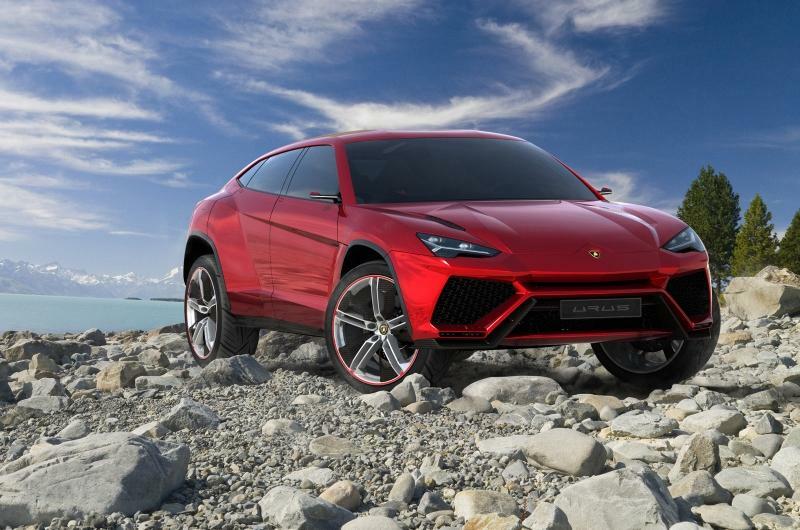 Lamborghini has achieved a major breakthrough by further developmening this method. Using the patented “RTM-Lambo” process, the final mold is no longer a heavy, complex metal piece, but is made instead from lightweight carbon-fiber parts, thus making the manufacturing process faster, more flexible and more efficient. The new Lamborghini V12 super sports car which will debut at the upcoming Geneva motorshow will feature an innovative and highly sophisticated suspension concept. 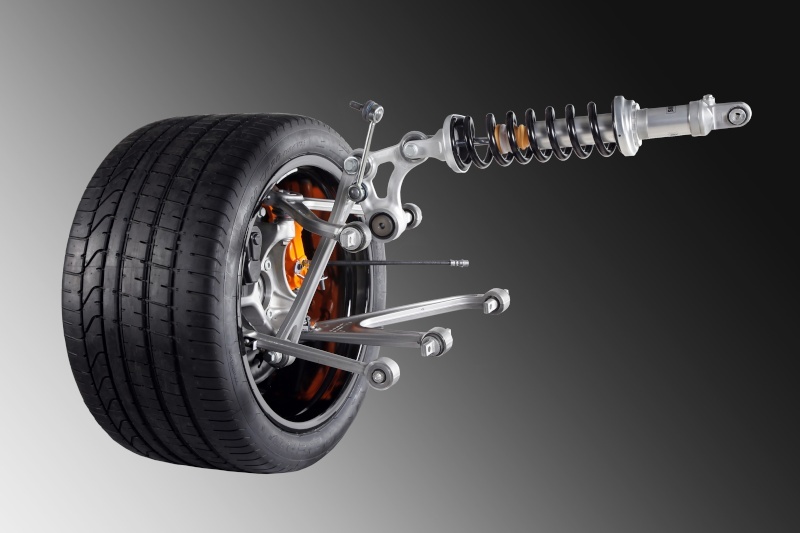 The pushrod spring and damper concept was inspired by Formula 1 and tuned perfectly to meet the needs of a high-performance road-going vehicle. 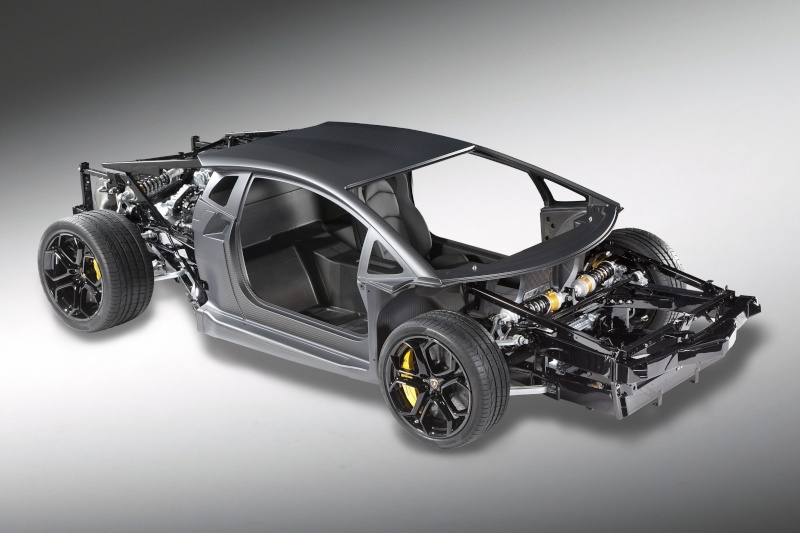 Together with aluminum double wishbone suspension and a carbon ceramic brake system, this lightweight chassis is another element of the unique technology concept in Lamborghini’s new flagship model. With its phenomenal engine output of 515 kW / 700 hp and its comparatively low vehicle weight, the new V12 super sports car from Lamborghini blasts its way to the very highest speeds. The most important characteristic of the new suspension is its design in line with the pushrod principle – inspired by Formula 1. The spring/damper elements are not located on the wheel mounts, but connected inboard to the bodyshell structure. They are transversely positioned: under the windscreen in the front and close to the engine in the rear. Pushrods and relay levers / rockers transmit the forces from the wheel mounts to the spring/damper elements. Aluminum and carbon fiber are also the most important lightweight engineering materials on the chassis. The entire suspension system, including upper and lower control arms, wheel mounts and relay levers are made from forged aluminum alloy. The large-diameter discs on the high-performance brake system, on the other hand, are made from lightweight and extremely hard-wearing carbon ceramic composite material. On the front axle, the ventilated discs measure no less than 400 millimeters in diameter, with braking force delivered via six cylinder calipers. On the rear axle, 380 millimeter diameter discs are used in combination with four cylinder calipers. The parking brake on the new Lamborghini top model is electrically powered.